A militia leader in the Solomon Islands has been jailed for life for the murder of Catholic priest Father Augustine Geve, a cabinet minister, in 2002. Harold Keke and two of his associates were found guilty of the murder. Father Geve was shot dead on a remote beach as violence between indigenous residents and settlers escalated. Australia, which sent a military force to end the chaos in 2003, welcomed the verdict, calling it a "significant achievement for the Solomon Islands". Australian Foreign Minister Alexander Downer and Justice Minister Chris Ellison said in joint a statement: "It demonstrates the Solomon Islands justice system is again able effectively to uphold and enforce the laws of the country. Keke, 34, Ronnie Cawa, 24, and Francis Lela, 22, had pleaded not guilty to murder. Keke claimed Father Geve was misusing money meant for his constituents in the Weathercoast region. Police in the Solomon Islands said Keke was responsible for a string of atrocities, including torture and beheadings, during a period of ethnic unrest that began in the late 1990s. The South Pacific archipelago was riven by conflict between indigenous residents of the main island of Guadalcanal and settlers from the province of Malaita, fought over land rights and jobs. Before the foreign troops arrived, the government in Honiara admitted it was powerless to stop the country's slide into anarchy. 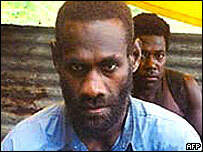 Keke and the Guadalcanal Liberation Front he led have been described as terrorists by the New Zealand authorities. He is expected to face trial for other alleged offences in the coming months, including the kidnap and murder of seven Anglican missionaries.